ABUJA – In an apparent move to stave off further embarrassment due to its inability to take control of its Twitter handle, @APCNigeria, the ruling All Progressives Congress APC has officially unveiled a new website and other social media handles. “The newly-designed website features a streamlined and uncluttered design, offering user-friendly functionality and rich content. This website as well as the official social media accounts offers quick and easy access to essential information and features to keep party members, the media and indeed the general public abreast of party activities, the APC-led federal government and APC-governed states”, the party said in a statement by its spokesman, Mallam Bolaji Abdullahi, Sunday in Abuja. “Visitors are encouraged to explore the new website and sign up for APC’s mailing list and newsletter to receive direct emails on the Contact Us page. Also follow the APC on the listed social media accounts”. Its former Twitter handle which was controlled by one Philip Obin had consistently attracted controversies to the party as a result of unapproved and ill-thought out tweets. At the weekend, the party woke up to another embarrassing backlash on Twitter as the handle controlled by Mr Obin was reportedly hacked while the new controller of the handle said he purchased it for $2000, and then went on to tweet messages that were considered demeaning to the party and President Muhammadu Buhari. It was not immediately clear whether the party actually had a hand in the fate that befell its former Twitter handle @APCNigeria which boasted of close to 800, 000 followers. 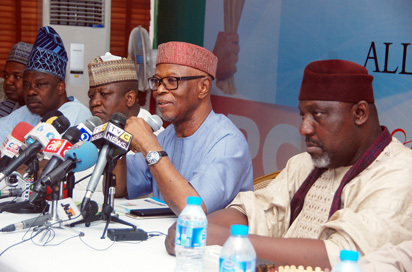 The post APC announces new website, social media accounts appeared first on Vanguard News.